Gopro Starlapse Rig by Tinfoil_Haberdashery is licensed under the Creative Commons - Attribution license. I wanted to design a rig to track celestial bodies through the sky for a timelapse with my gopro. Unfortunately, most designs cost upwards of $150 to make yourself. So I set about thinking of a way to track stars with a simple, cheap motor, and came down on a 24 hour "military time" analog clock movement. This is the driver for an analog clock the hour hand of which makes one rotation every 24 hours instead of every 12. This means that it moves at almost exactly the same speed as the earth but in the opposite direction, so if you align it properly it will make it look like the stars (or sun, or moon) are standing still while the earth moves underneath them...which is, of course, the case. I know this is a rather shabby design that's only really suitable for my specific camera. I'm posting this more to get the concept out there than anything else. If someone wants to do a redesign to work with a standard 1/4-20 tripod mount or something similar, drop me a comment and I'll definitely link to it. If you want to transport the rig without risking torque to the turntable, you can print the cover. Most of these items are designed to print without supports, with the exception of the gopro tripod adapter. I did a whole video on how to assemble the device, and then promptly deleted it. Thankfully, it's not that complex. This design is probably not perfect, but you can at least use my STLs for critical measurements when designing your own. Glue--I used 2 types, Cyanoacrylate for "hard" connections and Loctite Go2 glue for connections I might want to pull apart later. The clock movement outputs torque through successive sleeves onto which the hands are mounted. We're not using the minute sleeve or second shaft, so to make the device more compact I cut those off. I used a dremel, but a hacksaw and file would work too. Just be careful; burrs on the minute-hand sleeve might bind against the hour-hand sleeve and cause jerkiness, so I deburred with a razor blade after cutting. Next, if you're using a radial bearing, glue it in place around the threaded brass sleeve that's hard-mounted to the movement (I used soft glue for this). I initially designed for this bearing thinking it would be enough to support the camera and take the strain off the drive sleeve. It wasn't and I had to add the custom thrust bearing, but the thing is still designed around the vestigial radial bearing. Probably makes it sturdier, but I think you can just leave it out of you like. Next, the spline: In order to transfer the torque from the output sleeve of the movement to the turntable, print the spline and glue it to the "hour" sleeve with CA glue. Be careful not to get glue anywhere it will bind up the movement, like between the hour hand sleeve and the brass sleeve, or between the hour and minute sleeves. Next, the thrust bearing: Print out the turntable and bearing race. I recommend "dressing" these by filling them out with steel BBs (I think it takes around 24? ), placing it on the floor, standing on it and carefully pivoting. I weigh 200lbs and the bearing was more than adequate to support my weight. This smooths the bearing races and makes the bearing lower friction. After it's been dressed, I replaced my steel BBs from the hardware store with plastic airsoft BBs, which seemed to have about the same level of friction but were lighter and 1/50th the price. Now you're ready for assembly. Apply glue to the inside of the turntable where it will contact the spline, and to the bearing race where it will contact the base of the movement. Again, take care not to put glue anywhere that it might bind up the movement! With your BBs (plastic or steel) in place, carefully slide the bearing over the movement, ensuring that the spline on the hour sleeve seats into the matching socket on the turntable. Allow the glue to dry and you have a functioning time-lapse rig! I operated the adjustment knob on the back of the movement to rotate the hour hand while the glue was drying--just in case there was some glue where it shouldn't be, the hope was that this movement would prevent it from hardening while binding up the output shaft. If you want to align your timelapse rig with celestial bodies, it'll need to be angled to a reasonably precise elevation and azimuth. More on that later. The easiest way I've found to adjust this is to mount it on a tripod. I use Gopro mounting architecture, but you could pretty easily design other mounts. Print out the Gopro foot mount and, if necessary, the gopro tripod adapter. The tripod adapter is the only piece that should be printed with supports. Test fit them; if the fit is too tight, sand down the bottom of the gopro foot mount. 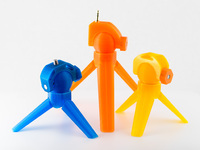 Place a 1/4-20 jam nut or low-profile nylock nut into the tripod adapter and screw it on to your tripod. Next, the grips--I designed this to work with a Gopro hero 5/6. slight adjustments to the concept should make this workable for other cameras. The grips are designed to friction-fit onto the turntable so that they can be adjusted for any angle. One grip holds the camera pointed parallel to the axis of the turntable (Polar Grip), the other holds it perpendicular (Equator Grip). The parallel grip is for shooting at the earth's axis (aligned with Polaris in the Northern hemisphere) and the perpendicular grip is designed for shooting at the earth's equator. Note that the polar grip prints with two eyelets for a "seatbelt" of shock cord. DO NOT ADJUST THE ANGLE OF THE CAMERA WHILE ON THE TURNTABLE! In other words, don't torque the turntable to change the angle of the camera--instead, remove the grip and re-attach it in the desired angle. Torquing the turntable will make a horrible crunching noise and probably strip the delicate drive gears inside the movement. Once you have your camera mounted and your whole setup on an adjustable platform like a tripod, you need to set your elevation and azimuth. I use a compass with an inclinometer for this. For tracking stars, your azimuth will be due north and your elevation will be equal to your geographic latitude. For tracking the sun, the elevation will be affected by the time of year. You can calculate it here. Say thanks by giving Tinfoil_Haberdashery a tip and help them continue to share amazing Things with the Thingiverse community. We're sure Tinfoil_Haberdashery would love a Tip, but unfortunately they have not setup their accounts to receive them yet.